Remember these cute ragged holiday purses?? When we introduced them we only had patterns available but now you can buy complete fabric kits! Our Ragged Pumpkin or Ragged Snowman bag kits have all the fabric, batting, cords, and notions you need to complete a ragged purse of your own. These bag kits are a great deal at $12.99 each and perfect for beginners who might not have all the batting, cords, etc lying around to make this purse. One purchase gets you the digital download pattern and all the fabrics and notions you need to make your bag. Just in time for you to complete and wear during the upcoming holidays! It’s time to give away another finished Ragged Pumpkin Purse! Leave a comment on this post to enter the giveaway for this pumpkin purse. ANY comment will enter you in the giveaway but if you feel like playing along you can complete this sentence: The strangest thing I have kept (or found) in my purse is a ______ . Comment entries accepted through Sunday, October 21st. A winner will be randomly selected and notified via email the following day. Love these purses! Fall is my favorite season! The strangest thing I have found in my purse was a rock. Apparantly my grandson put it in there for safe keeping! I love all of your rag purses and everything else on your site!!!! The strangest thing I ever found in my purse was my son’s toy cow. The purse is ADORABLE! I hope I can find time to make one someday. probably the strangest thing to alot of people would be an emiss bag. (vomit bag)…. they sure come in handy some times…. The purse is ADORABLE! I hope to find time to make one sometime soon. I am not able to enter the pumpkin purse contest. When I click on the space that says “The strangest thing I have kept (or found) in my purse is a ____.” It goes straight to the comments section. I think I am logged in. Don’t worry, Linda — your comment is your entry so you’re already entered! Good luck! The strangest thing I have kept in my purse is an egg.!! The strangest thing I found in my purse was an avocodo seed in a plastic bag!!!! I love this purse! It is perfect for the Fall season! I keep a measuring tape in my purse…I would love to have one of the purses..thank you and God Bless!! Probably the strangest thing found in my purse is a 15′ tape measure, but next to my wallet it has proved to be the most useful thing in there as well! I just love the rag purse and I thank you for another chance to win it. I hope to be the lucky winner! The strangest thing I have found in my purse was one antique Skee ball. I was given 6 of them and dropped them in my purse with the intent of taking them out when I got home. I missed one and kept wondering why my purse was so heavy! ( I have a big purse!) I know some of you are wondering why I would even want 6 Skee balls but they are antique with a great patina on them and I thought they would look great in a bowl on the coffee table , like an orb. Anyway, I did finally realize that the extra weight in the purse was the Skee ball and now all 6 have a home in my house. As you can tell, I love antiques and homespun fabric is right up my alley! I love the purse and would be thrilled if I received it. Love fall and my kids collected acorns and put them in my purse. I love these purses and their simple design! Love it! Thanks for the second chance! I once found some wilted lettuce in my purse. Love this purse. So adorable!!! The strangest thing i found in my purse was a large sleeve of plastic bag twist ties. Don’t remember why they were in there, but they are… Go Figure!! Love your fabrics. Ordered pattern for valances, now I’m deciding what color fabric to go with. This is a really cute purse. Perfect for this time of the year. Love your fabric. I’ve been making homespun fabric pumpkins and they are adorable. Love that purse. Can image making a different themed one for each month of the year! Absolutely Adorable, I love both purses. I also love the material I ordered & can’t wait to complete some projects & order more. May God bless all of you! I would love to be entered in your giveaway. Thanks for a second chance to win the cute pumpkin purse. The strangest thing I keep in my purse is a tape measure. Beautiful purse, this year since I just started retire a month ago, so I start working on rag quilts, it drives me crazy and could not wait to finish my project. Hope I will win this one. God bless you. LOVE this raggedy purse!!! SO adorabel! Hmmm….The strangest thing I have kept (or found) in my purse is a can of soup. One day I wondered why it was so heavy and forgot a I grabbed a can of soup a few days previous to take to work. The pumpkin purse is absolutely adorable! !Would really love to win it! P.S. Love your fabric’s as I am making a raq quilt!! Would love to have that sweet little gem for a sweet little gem in my life! Cute Cute Cute! Love, homespun fabric and am so grateful to know I can find exactly what I need here! There are fewer and fewer outlets carrying this sort of fabric! Thanks!!! I love making rag quilted projects and the purses are really cute. I have carried everything under the sun in my purse at one time or another. Currently I have 1308 books in my purse. You may wonder how this is possible; it is my Kindle e-book reader. I have a huge library with me at all times. LOL Who knows, next time I’m at the doctor’s office someone may need a recipe for pumpkin pie and I’ll have it at my finger tips. Wow would love to win this. Strange thing in my purse would be jam. Forgot it was in there got a whole in package and you now it a big mess. Learned a lesson on that one. Hi Diana — LaRae M. won the pumpkin purse. 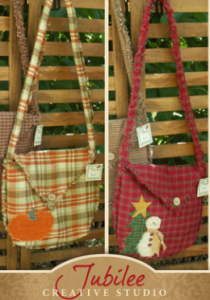 We’ll be giving away two ragged snowman purses in Nov/Dec though so check back for that giveaway! You can always view our winners (after they have responded to our email) on our Giveaway Winners page.